District Women Hospital Akola (Akola Zilla Mahila Rugnalaya), Akola Published Job Notification for 30 Nurse Posts. 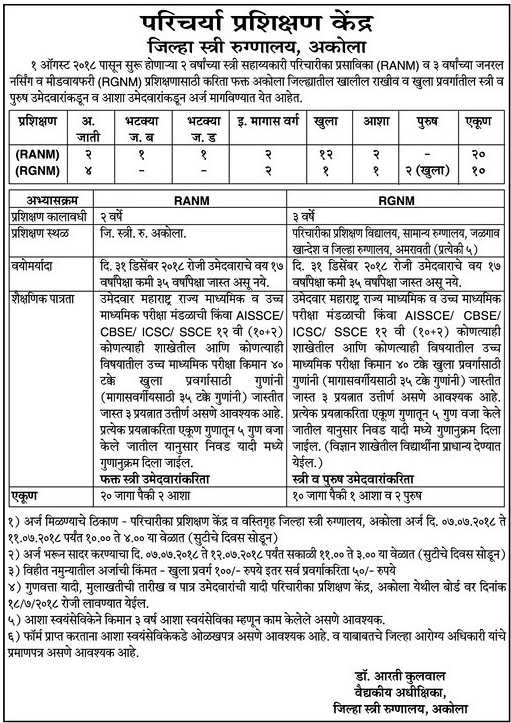 Candidates who wish to apply must look at District Women Hospital Akola Nurse Recruitment 2018. Eligible candidates can apply Offline before 11-07-2018. Education Qualification: AISSCE/CBSE/ICSC/SSCE 12th pass with ANM or GNM Course. For Post wise Education Details follow the detailed advertisement. Age Limit: 17-35 Years as on 31-07-2018. Starting Date, Last Date to Apply Offline at Akola Zilla Mahila Rugnalaya which candidates should be remembers as follows. Start Date to Apply Offline: 07-07-2018.